Mannar : leading the way to Mannar via Puttalam alongside the costal way bring you windy atmosphere, pass by cashew nut, coconut plantation gigantic wind power plant. Once you pass the re, get into the forest and proceed nearly 50 km trough the thick jungle where wild elephant. Different animals and bird species come across. The track is really hard with mud and sandy. Ride and feel the taste of jungle off road ride. Stay at Mannar. Jaffna : Having breakfast get in to the bike and read the typical road ways where similar to the experience of previous day. Hard to ride and on our way to Jaffna many things to see, Mannar Dutch port, boab tree, Punareen fort, thick jungle, ruin and dilapidated house and building. As a daily routine we take our breakfast ride our bike to the Mullative (dusty and windy area) via Vavunia, unending jungle riding through the remote village. From Vavuniya to Anuradapura well maintained road. 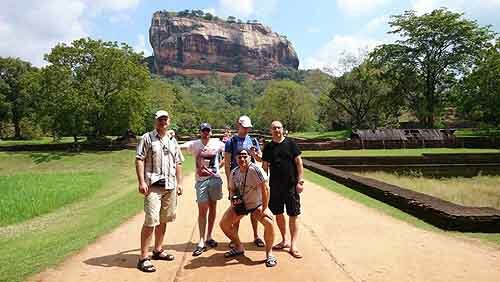 Reach to Anuradapura considered as a first kingdom. Kandy located in the Central Province, Sri Lanka. It is the second largest city in the country after Colombo. It was the last capital of the ancient kings' era of Sri Lanka. As well as most famous place for the religious, trade and commercial. 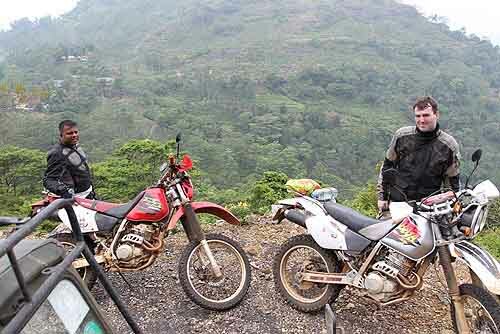 We get on to the saddle and leading to north side of the knuckles range through the tea bush and jump in to the off road which gives you hard riding alongside the unending steep. Have a nice tea in the jungle aria and quick visit cascading water falls. Finding the alternative route to access Kandy. As usually we take our breakfast, say good bay Kandy and heading to the 'Little England', in a splendid landscape. Always green grass, blessed with salubrious fine bracing mountain climate, breathtaking views of valleys, meadows, mountains, Red or green roofed plantation bungalows, English country style homes, hotels with lovely flower gardens, a fine 18-hole golf course and a racecourse gives locality an aspect of "colonial British style". Nuwara Eliya is also the heart of Sri Lanka's tea country producing some of the world's best tea. Stopping for the tea at labukele tea factory. Inside the factory you will read the history of tea plantation and how tea is being processed up to the power from the leaves. Prior to that we pass the Ramboda tunnel and off road experience. From hill country to the dry zone. We take our breakfast and set off to Tissamaharama for wild safari, in between we pass many places which bring you amusement. Horton place, Large Savannah plains, Waterfalls, High pure water, Forests and several natural and high eco diversity areas are available to visit at Horton Plains. Horton Plains is controlled by Wild life department of Sri Lanka..This area is high more than 2300m above from sea level. Baker's waterfall is popular waterfall which is at Horton Plains. Worlds End which is highest mist gap of Sri Lanka is also at this place..
Lipton seat : The Lipton's Seat is located at Dambetenna in the Haputale Mountain region. This place was a favorite look-outpoint for Sir Thomas Lipton. The point has a fabulous view over Uva, Southern, Sabaragamuwa, Central and Eastern provinces. Lipton tea is still famous tea in the world but people can't imagine where its from. It is Srilanka I take you to the summit of the tea kingdom. Two optional I have with me one off road or tar mat hairpin road. It is up to you decide once you finish the Lipton summit. Passing Ravana waterfall, we get into platern road and leading it to Tissa through banana plantations and paddy field. Safari to Yala, 4X4 JeepVery early should wake up and, set off to the yala national park before dawn, then you will be able to see the leopard on the rock. Sri Lankan Elephants, 44 species of mammals are resident in this, and it has one of the highest leopard densities in the world. 25 individual leopards are estimated to roam in Block I. The elephant herd here contains 300–350 individuals. Sri Lankan Sloth Bear, Sri Lankan Leopard, Sri Lankan Elephant, Wild water buffalo are threatened species that Yala is harboring. Although water buffaloes are indigenous to Sri Lanka, most populations contain genes of the domestic stock or are descended from feral stock. Toque Macaque, Golden Palm Civet, Red Slender Loris, and Fishing Cat are among the other mammals that can be seen. Back to hotel and lead the way to next destination. Mirissa and its breathtaking sandy beach pretty much transform your dreams and visions of a tropical paradise into an everyday reality. This is located close to the Southern tip of the Island of Sri Lanka. Reach to Kuruwita via Rathnapura, Kuruwita is very famous for gem and cascading waterfall name bopath fall. Flowing the two off road experience we get in to the Kitulgala, off road are very hard to explain crossing mni water stream, muddy sandy and hilly area, it is yet another hurdle to reach to Kitulgala. There you can engage white water rafting and camping. Kitulgala is a primary spot for bird watching enthusiasts. Reach to Negombo through tea, rubber, coconut and pineapple plantation (optional off road experience).